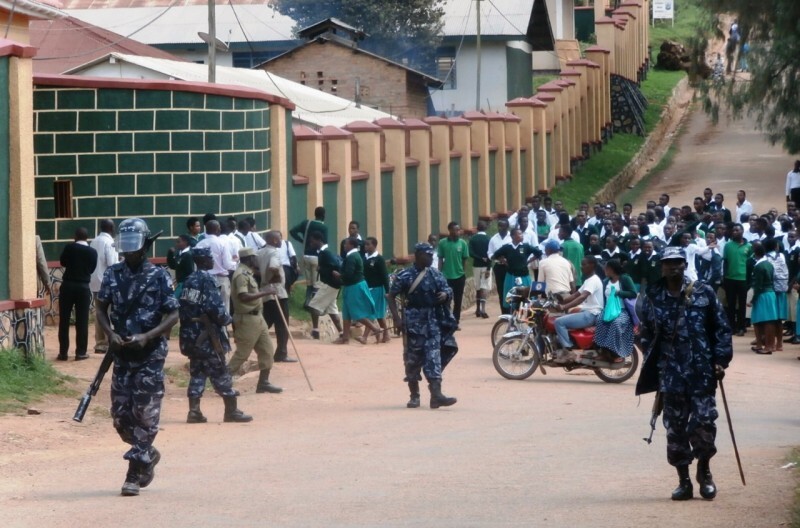 KABALE – Police in Kabale was on Thursday, March 14 forced to use tear gas in order to disperse students’ strike at Kigezi High School protesting the decision by the school management not to participate in the 2019 Copa Cocacola Football Competitions. Sources say that on Wednesday, the school management led by Rev. Dr. Medard Rugyendo, the Chairperson Board of Governors resolved not to participate in the Copa Cocacola competitions scheduled for next week due to financial constraints, something that students did not comprehend with thus rioting. The Administration also resolved to suspend bursaries for all footballers and salary for the school coach, Denis Tushabe until the school stabilizes financially. Following this, the students who were channelled to go for classes instead of going for screening at Ndorwa Secondary School playground in Kabale Municipality started striking and abusing teachers. Immediately, the police led by Henry Kisembo, the officer in charge of the Field Force Unit at Kabale Police Station were invited to intervene. However, the students attacked the officers with stones forcing it to use tear gas and live bullets. The students wondered how the administration could take such a radical decision yet the learners are forced to pay sports fees every term. Stephen Mugume, the school head teacher, however, blamed the students for overreacting yet management is still discussing whether or not to participate.